— Cathy Langer in our lead buyer at Tattered Cover with three decades of experience. — Jackie is Book Blogger #1 at Tattered Cover. Her word is gold. 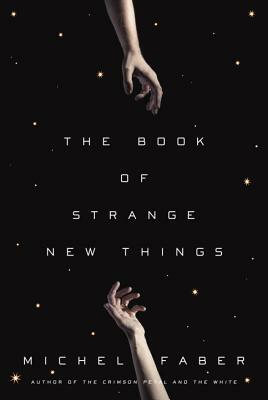 A monumental, genre-defying novel that David Mitchell calls "Michel Faber's second masterpiece," The Book of Strange New Things is a masterwork from a writer in full command of his many talents. It begins with Peter, a devoted man of faith, as he is called to the mission of a lifetime, one that takes him galaxies away from his wife, Bea. Peter becomes immersed in the mysteries of an astonishing new environment, overseen by an enigmatic corporation known only as USIC. His work introduces him to a seemingly friendly native population struggling with a dangerous illness and hungry for Peter's teachings his Bible is their book of strange new things. But Peter is rattled when Bea's letters from home become increasingly desperate: typhoons and earthquakes are devastating whole countries, and governments are crumbling. Bea's faith, once the guiding light of their lives, begins to falter. MICHEL FABER is the internationally bestselling and critically acclaimed author of The Crimson Petal and the White, Under the Skin shortlisted for the Whitbread First Novel Award and several other books. Faber has won many short story awards and his writing has appeared in Granta, The O. Henry Prize Stories, among others. He lives in Scotland."